2017 was a bit of a crazy year, all things considered. I have been a part of RPG Site since it was originally founded way back in 2006, and since that time, it has grown by leaps and bounds. So before I get to my list, I want to do a brief moment of reflection. A lot of it has to do with our talented staff, and of course, our wonderful readers! 2017 was a watershed moment for us where we were able to hire even more people as a result of our significant growth. In fact, 2017 will go down as the biggest year for us yet! With that being said, there were plenty of reasons for why this is the case. Aside from the different events we were able to cover, there were just some absolutely incredible video games we had the honor of producing content for. Sure, we may have dabbled a little on the old for nostalgia's sake (be sure to check out my Final Fantasy Tactics piece), but I can't remember a year where I was fortunate enough to review or discuss as many quality games. Nowhere is this more prevalent than the output from Japan. Sure, you will read plenty of editorials talking about how Japanese game development is relevant in the industry again, and that may be a tad overblown - they never really went anywhere. However, a lot of that has to do with the success of the Nintendo Switch. Among the big three - Sony, Microsoft, and Nintendo - it was Nintendo who really showed everyone how it's done. This is crazy because going into 2017, I had a lot of doubts about whether the Switch really has a market. The fact they didn't halt 3DS development right then and there in favor of their new console had me considering whether the house that built Mario really understood the modern market. After all, why would anyone buy a Switch when they can play all their favorite games, including Pokemon, on a different portable device? Now that 2017 is almost over with, I can happily say I was proven wrong. Earlier this year, I was able to get my own Nintendo Switch and had an absolute blast with it. The fact I was able to take console experiences with me wherever I go was a fascinating proposal. Does that sound familiar? It's the exact same selling point Sony made with both the PlayStation Portable and the PlayStation Vita. The difference is, the Switch actually has first-party support, and with that, a lot of developer excitement around it. That isn't to say Sony didn't put out some great games of its own this year, but my beloved Vita was shoved into obscurity without any mention during any of the conferences. Gio Corsi was never around to give us the reassurance we craved. Undertale may have been the biggest announcement for the platform, and it was done on a preshow. Couple that with Andrew House's comments that there's limited potential for handheld gaming, and you wonder what happened to the Sony of a few years ago that made the case console gaming isn't dead. That hubris Sony used to have during the PS2 era has come back with a vengeance. The PS4 didn't receive any exciting new features throughout 2017 to really speak of. Many of the games from Japan that used to be Sony exclusive are now coming out on the Nintendo Switch and PC (.hack, Atelier, Disgaea, etc). You also have them denying the fanbase cross-play functionality so they can play games like Rocket League and Minecraft with their friends on other consoles. The amazing PS2-on-PS4 feature that started off strong with games like Rogue Galaxy and Dark Cloud 2 has all but completely vanished; they would rather push their PlayStation Now service than give us what we want. On the other side, you have Microsoft really pushing the Backwards Compatibility feature with a ton of great games to play. Okay, I am still waiting for Tales of Vesperia and Eternal Sonata, but the fact Blue Dragon is there and they even gave Lost Odyssey for free in late 2016 made me appreciate it all the more. There have even been tangible performance improvements for those games thanks to the emulation software Microsoft is using. Yes, the Xbox One may not have any real titles to get excited about on the horizon, but at least the company is really trying to get back in our good graces. It reminds me a lot of how Sony worked hard to salvage the PlayStation 3's ugly launch and eventually becoming successful with it as a result. About a year ago, Microsoft gave the Xbox One infrastructure a big boost to download speeds. Meanwhile, Sony raised the price of PlayStation Plus without giving much back to the community afterward. I am excited to play games like Shadow of the Colossus, Zone of the Enders 2 Remastered, and Valkyria Chronicles 4 next year on my PS4, but in my eyes, they have a lot of work to do to stop taking the PS4's crazy sales numbers for granted. Make me love you again, Sony! Now that this long preamble is sorted, I would like to take this moment to look back at 2017. As I said at the top, it has been an incredible 12 months in gaming. With this in mind, I would like to count down my Top 5 favorite games of the year. Before I do, I will first go over some honorable mentions. Terra Battle 2 is vastly superior to its original release, adding in a large overworld map and a far more cohesive story. Unfortunately, that same story is weighed down by lackluster dialogue that pulled me out of the experience. Even with that being the case, it's certainly a far great effort by Mistwalker. And with their plans to release both Terra Wars and Terra Battle 3, it's clear Hironobu Sakaguchi sees the series as his Final Fantasy. I just hope it becomes something more than just moving portraits around a grid. For now, Granblue Fantasy still takes up most of my mobile gaming time. Metal Gear Solid V: The Phantom Pain. Okay, the reason it's not on my list is due to the obvious - it didn't come out in 2017. Regardless, I had an insane amount of fun playing this game as a huge fan of the Metal Gear series. I didn't really give it the time of day until around the summer when there wasn't much else to play. That led to me completing every mission, subquest, and objective the game had to offer until I got the Platinum. While the story may have been really lacking, the amount that was there still had me fully engaged. After looking at it more as a mission-based game with the dressings of a plot, I was able to enjoy it more. It was free through PlayStation Plus a few months ago, so if you were able to pick it up and haven't given it a try, I highly recommend doing so. Oh, and Flaming Buffalo deserves her own game. Finally, Nioh. Oh, Nioh. I loved you so much when you first launched. I even went so far as to give you a 9 out of 10 in my review. Sadly, Team Ninja royally screwed things up in the months that followed. They truly don't get what it means to balance a game. I went into a long diatribe about my real problems with the game, but it really boils down to the developer doing everything in its power to screw over its fanbase and squandering any goodwill it had built up over its strong beta period. I can't reward any game that makes me wastes dozens of hours of game time for the dumbest of reasons. I would also like to mention I didn't get the chance to play some of the biggest releases of the year. That includes games like Persona 5, Yakuza 0, Wolfenstein II, Super Mario Odyssey, Pyre, or Assasin's Creed Origins. I also only played about 10 hours of Divinity: Original Sin 2, so I don't really have a full opinion of it right now, and I wouldn't feel comfortable rewarding it this early. I will say it has been great to me so far. This is part of the reason why I made this a Top 5 rather than a Top 10 like Josh did. Now, on to the list of my Top 5 Games of 2017! I have already heaped praises on this in my review, but I still feel really strongly about how much I enjoyed my time with Utawarerumono: Mask of Truth. It's kind of funny considering I admitted in my review for Mask of Deception that I didn't quite finish the game before I covered it. This led me to experience an extremely well-told story filled with dramatic (and sometimes hilarious) twists and turns that made me really care about the plight of the characters I interacted with. I will also admit there was a moment later on in Mask of Truth that made me cry. Not just cry, it completely wrecked me to the point I can't stop thinking about that sequence of events to this very day. A lot of it has to do with the incredible performances of the voice actors and its superior localization. And in a year where there was a lot of controversy around poor localization - Ys VIII, DanganRonpa V3, and Persona 5 come to mind - Mask of Truth was in a league of its own. If you come to RPGs for the story and the characters, you owe it to yourself to play this game immediately! Just note this is a sequel to Mask of Deception, so I would urge you to play that entry before playing this one. Well, this came out of nowhere, didn't it? I have always had a lot of appreciation for the Killzone series for the way in which it subverts your expectations of the FPS genre. While everything around it may seem like some sort of cyberpunk Halo (Killzone: Shadow Fall is pretty much Blade Runner), there's just something in the way it depicts the plight of its characters that had me eager for the next entry. Imagine my surprise when Guerilla Games announced their next game would be an original IP called Horizon Zero Dawn, an open-world RPG about robot dinosaurs. Wait, what? Just think about this. Guerilla could have very easily gone the safe route and made another Killzone game. No one would have faulted them for this (okay, some world, but stick with me). Most of the time, publishers are ready to put their thumb down at the risk of losing millions of dollars on an original property. That's part of what makes Horizon Zero Dawn so fascinating. Much like The Legend of Zelda: Breath of the Wild, this was their first attempt at an open-world game and they really nailed it in almost every respect. It takes some familiar elements and mixes it in with fresh new ideas while boosting it up with high-production values. You also have a fascinating story about these events that lead up to and follow society's collapse. In the end, they took what is essentially a near-impossible concept in a risk-adverse industry and make it seem like a cakewalk, and I can't wait to see what they'll do next! I consider myself to be a big fan of the original Nier to the point of being a bit of an apologist. Whether it was the story, the characters, the environments, the often sentimental sidequests, or the soundtrack (good lord, that soundtrack), there was just so much to love about it. The fact that this was birthed from one of the multiple branches in Drakengard (an objectively bad game) makes it all the more stunning. It's the type of experience you have that stays with you years after the fact. That's kind of the feeling I had with Nier" Automata, though it may be too soon for me to really say what kind of impact it has had on me. On the outset, the biggest news this game had was that PlatinumGames would be coming in to handle the gameplay - inarguably the weakest part of the original Nier. It may take a while to get going, a hallmark of many a title in this genre, but once it does, everything from the setpieces and shooting segments to the moments discussing A.I. psychology and tragic backstories had captured my full attention. This is important because it was these elements that allowed me to put up with Route B, a real slog that nearly killed my enjoyment. However, after that, I was once again completely enthralled. My only complaints were that 9S's voice acting really got on my nerves in Route C, especially the silly evil laughter that had me rolling my eyes hard. The gameplay also doesn't really change that much from the early goings. When new features were introduced, I felt no need to change up my playstyle. Instead, I placed my undivided attention on the narrative and how it attempted to portray the nature of humanity in a very personal way. I won't spoil it for you, but I haven't had such an uplifting experience in a video game as I did in Nier" Automata's Route E. In a way, this game is exactly what the doctor ordered for how terrible 2017 has been in the real world. In my mind, The Legend of Zelda is easily the best property Nintendo has. Nowhere else has there been as much innovation or as much excitement in gameplay as there has been in this franchise. Games like A Link to the Past, Ocarina of Time, and Majora's Mask are all worthy of heaping amounts of praise for the way in which they revolutionized the genre (more the former two than Majora's Mask, but dammit, I love that game). Nowhere has that formula been more perfected than in Breath of the Wild. Nearly at the very beginning, the game gives you a lot of freedom to do whatever you want without being pigeonholed into a strict narrative. Yes, that is essentially the nature of open-world games like this one, but it felt like the game was really motivating me to try and explore every corner of the world. I never even bothered to use a guide as I navigated my way towards Hyrule Castle, and I was grateful for making that decision. 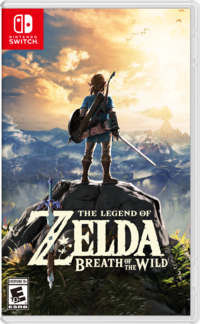 I fully understand how Breath of the World is meant to be more a reaction to what other titles have been able to accomplish in this genre, but Nintendo was able to hit a slam dunk. The world is filled with a vibrant richness that is dense with things that are desperate to grab your full attention. Not even The Witcher 3 was able to make me stop everything I was doing even in the middle of the main story quest just so I could detour towards something I caught out of the corner of my eye. I may begin the day planning out what I want to do and more than likely not even getting anywhere close to finishing it due to these wonderfully entertaining distractions. For a series that is well-known for holding your hand from start to finish, Breath of the Wild approaches things from the opposite side of the spectrum. In this huge, non-linear environment, you are able to explore and climb over practically everything. There are also all the different elements at play including weather, temperature, electricity, magnetism, and even enemy behaviors that serve to either work with you or completely against you. Yes, I hate the rain and weapon durability as much as the next person (the Master Sword SHOULD NOT be allowed to break), but when you couple all these amazing features with an incredibly charming story and drop-dead gorgeous cel-shaded visuals, this lovingly-crafted world has set the benchmark for what the genre should offer going forward. Good lord, where do I begin. I never had a chance to play Night in the Woods when it was originally released at the beginning of the year. However, after seeing so much amazing fanart on my timeline, I know I needed to give it a try. Boy, am I glad I did. There's just so much about this game that speaks to me. It tells the story of a young feline named Mae, an only child who comes home after dropping out of college. Despite only being gone for a couple years, she quickly discovers how much her hometown has fallen on hard times. Many of her favorite places have shut down and the mall is a husk of what it used to be. No one is more surprised than her parents who now have to deal with their daughter cutting out of school early despite all the sacrifices they had to make sending her there originally. All the while, some dark and strange events are happening behind the scenes. It hit really close to home in a way I didn't expect. But really, it was really the interaction between the characters that really sealed the deal for me. Whether it was the vignettes between Mae and her mom or the genuine moments between her friends, you really get the feeling this is coming from a small team of developers who have really lived out these experiences themselves. There's just something both charming and unsettling about this game. Sure, Mae can be a jerk at times, but that's what makes her all the more natural a character. She's a bit of a wreck and her method of coping is to lash out at others. You can tell she's really ashamed of the reasons behind her dropping out of college, but she's young enough where she is still trying to figure things out. It's something I can relate to; when I feel anxious or depressed, I become sarcastic or defensive, and it takes me a while before I am able to realize the consequences of my behavior. Every important character in this game has their fair share of demons and they deal with it in their own way. It's for these reasons and more that Night in the Woods is my favorite game of 2017.